First revealed to Westerners in the chronicles of Marco Polo, Japan was a legendary faraway land defended by a fearsome Kamikaze storm and ruled by a divine sovereign. It was the terminus of the Silk Road, the furthest end of the known world, a fertile source of inspiration for European artists, and an enduring symbol of the mysterious East. In recent times, it has become a powerhouse of global industry, a nexus of popular culture, and a harbinger of post-industrial decline. With intelligence and wit, author Jonathan Clements blends documentary and storytelling styles to connect the past, present and future of Japan, and in broad yet detailed strokes reveals a country of paradoxes: a modern nation steeped in ancient traditions; a democracy with an emperor as head of state; a famously safe society built on 108 volcanoes resting on the world's most active earthquake zone; a fast-paced urban and technologically advanced country whose land consists predominantly of mountains and forests. 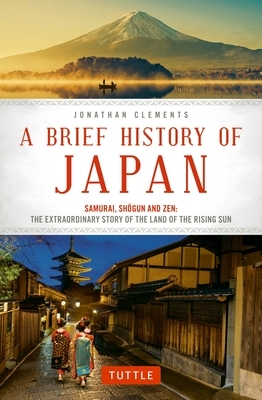 Jonathan Clements is the author of Christ's Samurai: The True Story of the Shimabara Rebellion, A Brief History of the Samurai, Modern Japan: All That Matters, Anime: A History, and biographies of Admiral Togo and Prince Saionji Kinmochi. In 2016 he became the presenter of Route Awakenings (National Geographic) a TV series on historical icons of Chinese culture.